What is the Cost of Living in Maryland? 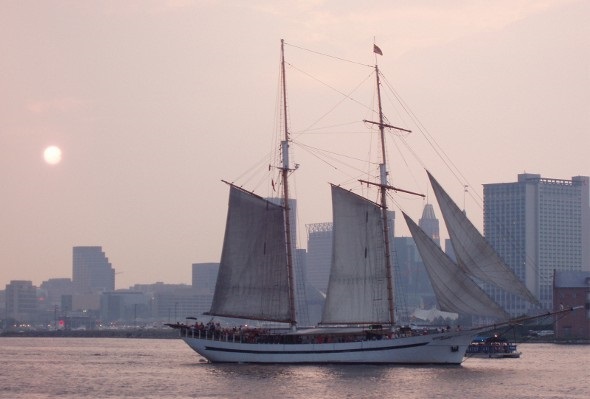 Maryland is a mid-Atlantic state with a lot going for it. And we don’t just mean the crab cakes. Ready to learn more about the cost of living in Maryland? We’ve got you covered. From housing costs and taxes to education and utilities, here’s our guide to the cost of living in Maryland, the Old Line State. Check out our cost of living calculator. There isn’t a county in Maryland with an average list price under $100,000. The least expensive homes are in Allegany County, which has an average listing price of $103,360. The priciest homes are in Talbot County, where the average listing price is $649,953. According to the Census Bureau, the median value of owner-occupied homes in Maryland between 2010 and 2014 was $287,500. That’s a whopping 63.6% above the U.S. average for the same period, $175,700. Still saving up for a down payment? You should know that rent in Maryland is on the high side. In fact, from studios to three-bedroom apartments, Maryland rents are higher than the average rent in the U.S. 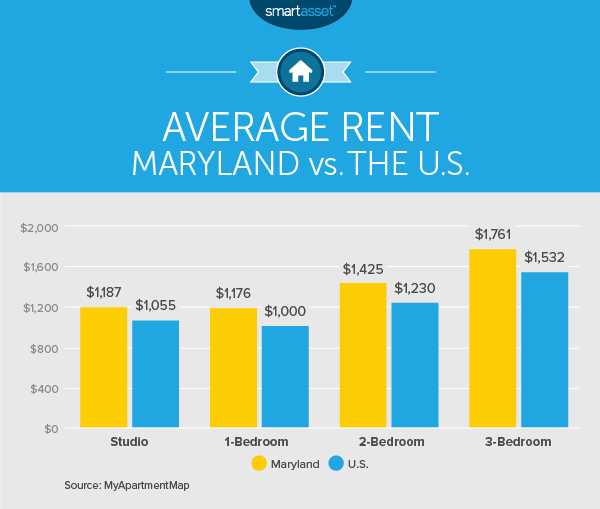 Check out the chart below to see how rent prices in Maryland compare to the national average. According to myapartmentmap.com, a studio in Maryland rents for an average of $1,187, $132 above average. One-bedroom apartments in Maryland are $175 above the average at $1,176. If you need two bedrooms you can expect to pay around $1,425 in Maryland. That’s $194 higher than the U.S. average. Three bedrooms go for an average of $1,761 in Maryland, $228 above the national average. Check out our mortgage calculator. Unless your utility costs are included in your rent or your condo association fees, you’ll have to cover your utility bills yourself each month. 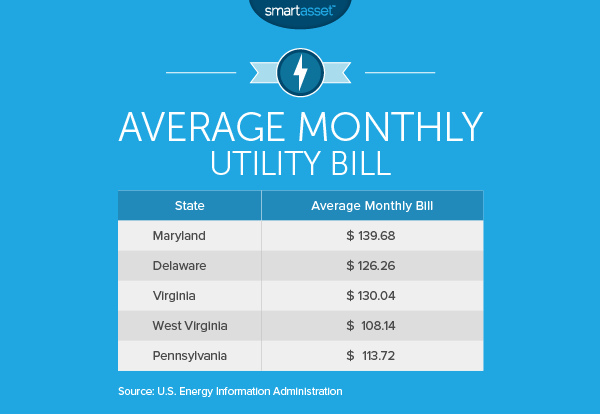 According to the U.S. Energy Information Administration, the average monthly utility bill in Maryland is $139.68. That’s 22% above the national average of $114.09. Check out the chart below to see how Maryland’s utility costs compare to costs in neighboring states. A 30-day pass for Baltimore’s public transit will cost you $68. That includes the plastic CharmCard used on Baltimore (“Charm City”) public transportation. If you want express bus service, too, you can buy an $85 CharmCard. Prefer to drive? According to gasbuddy.com, the average cost of a gallon of gas in Maryland is $1.844. That’s a little over 3% higher than the national average of $1.785 at the time of this writing. To get a Maryland drivers license you’ll pay a fee at the DMV of $48 for a license that’s valid for 8 years, $42 for a 7-year license, $36 for a 6-year license or $30 for a 5-year license. Renewing your license costs $6 per year. How does Maryland stack up in the tax department? The state has a progressive income tax system, at both the state and county levels. State income tax rates range from 2% to 5.75%. County rates range from 1.25% to 3.2%. Maryland also has a 6% sales tax. What about property taxes? The average effective property tax rate in Maryland is 1.04% – below the national average. Property tax rates range from 0.56% in Talbot County to 1.43% in the city of Baltimore. Taking care of all of your finances while attempting to minimize your taxes is much easier said than done. Our choices of the top financial advisor firms in Maryland can help you out. In-state tuition at the University of Maryland comes to $9,996. Including transportation, books, meals and lodging, the university estimates the total in-state cost to be $24,587. That’s a good deal relative to the university’s estimate for out-of-state students: $45,735. According to research by the Kaiser Family Foundation, the second-lowest-price Silver plan on the Health Insurance Marketplace in Baltimore, Maryland has a monthly premium of $249 for 2016 coverage. That’s up 6% from 2015. In a Commonwealth Fund study ranking the overall health systems of all 50 states and the District of Columbia, Maryland scored an impressive 5th. But when ranked by the number of uninsured ages 0-64, Maryland ranked 31st out of 49. There’s plenty to do in Maryland. If you’re a history buff you can check out Antietam National Battlefield for just $5 per person or $10 per vehicle. A vehicle pass for Blackwater Wildlife Refuge is just $3 and if you come on foot or on a bike it’ll cost you a mere $1. For an indoor activity, you can check out the National Aquarium in Baltimore. Basic admission for adults is $24.95. If you’re thinking about moving to Maryland, it can be helpful to know how the change will affect your budget so you can plan accordingly. If you’ll be starting a new job, your paycheck may end up looking quite different than it does now. Try using our Maryland paycheck calculator to estimate what your new take-home pay will be. A financial advisor can help you navigate big life changes like a cross-country move, or just help you to meet your financial goals in general. A matching tool like SmartAsset’s can help you find a professional to work with to meet your needs. First you answer a series of questions about your situation and your goals. Then the program matches you with up to three advisors who meet your needs. You can then read their profiles to learn more about them, interview them on the phone or in person and choose who to work with in the future. This allows you to find a good fit while doing much of the hard work for you.